I'm feeling depressed lately because I'm having the problem again. It's a fact that i solved it but i have to change the program that I'm using from time to time or I have to change the IP address and the port number. I'm feeling bored from doing these stuff and I don't know how long I'm going to struggle??! As u see on this wallpaper, I don't know if it's simple or what but i don't have the same motivation of doing my old wallpapers because of the problem. 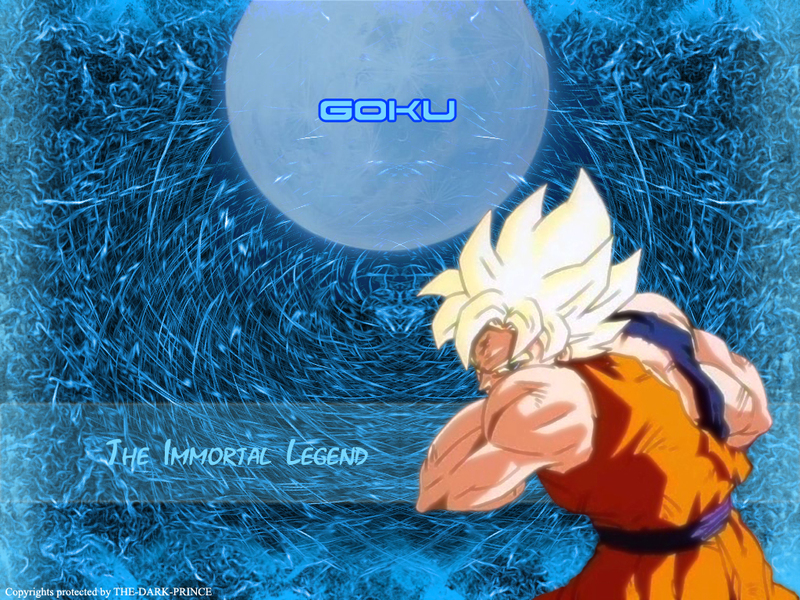 Howeverm i worked quite hard on cleaning the picyure of Goku and on making the background. Hey it is goku!! I love the Dragonball series..I like all of them..cool. Oh wow! Goku!! He's super cool! for him, it's so cool! Good work! I like it! The words say it all! Goku is a legend, his power and kindheartedness is confirmation of that. Great background, to me it shows his inner spirit! Fine job! Thank you for sharing it and i'm really sorry to hear that you are still have problems. I ask everyone, is there a better wallpaper? I think not. 5/5. This is 73h r0x0r5. I love it. Goku forever! the background effects are very kewl and fits well with your scan! hope you'll feel better soon, dark...and good luck with your isp probs! Nice wallie. But I think the bubble with >>goku<< in it. should be omit. Nice work !! I love it !!! Goku is so cool and great !! Nice background !! Thank for sharing it with us !!! we need more ogange don't we? Wow cool. I don't think I've ever seen a dragonball submission before... hmm. Goku's muscles freak me out, but this picture is great! can I just say once more that I love this wallpaper? can I say again it's a definite 5/5? I think I can! Dark, keep up the good work! Thanks for sharing!! ooh i love the background, it looks really cool!! Thank you.. also good picture today see!!! bakuhaysu son go ku!! wow thats really cool i like the background and the character looks great. sorry it took me a while to comment on your submition i was working and then my computer needed adjustments anyway great wallpaper!! excellent work as always! Hah, a Dragon Ball Z fan! Nice...thanks for sharing this with all of us here! I like the background for it, i just wish this pic showed a bit more goku's face when he did the kamamha, like if the camera shot him on the other side of him. Hey it is goku! I love the Dragonball series..I like all of them..cool.